Kentucky bluegrass (Poa pratensis) and fescues (Festuca spp.) 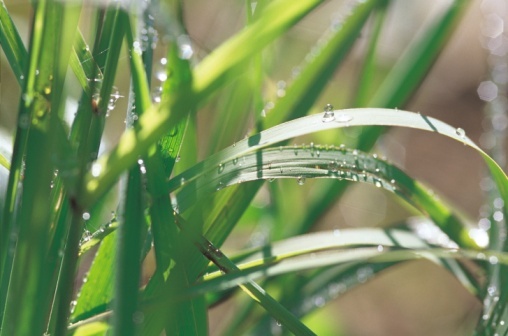 are cool season grasses, meaning they grow best in temperatures between 65 and 75 degrees Fahrenheit and are best suited to central and northern parts of the United States. Fescues used for turf include tall fescue (Festuca arundinacea), red fescue (Festuca rubra) and hard fescue (Festuca longifolia). Red fescue and hard fescue are sometimes described as fine fescues because of their fine, needle-like leaves. Fescue varieties have slightly different growing and wearing characteristics than other common grasses. Kentucky bluegrass grows in U.S. Department of Agriculture plant hardiness zones 1 through 9. Tall fescue grows in USDA zones 3 through 8; red fescue is hardy in USDA zones 1 through 7, and hard fescue in USDA zones 4 through 9. Kentucky bluegrass seeds are slower to germinate than fescue seeds. Kentucky bluegrass spreads by underground stems called rhizomes, forming a tough, dense sod. When foot traffic or wear causes bare spots, the rhizomes move back in to restore the sod. Fescues grow in bunches that don't form as dense a sod or spread as well as Kentucky bluegrass rhizomes. You have to reseed bare patches of fescues, while Kentucky bluegrass will heal them itself. Kentucky bluegrass turf requires more fertilizer and more frequent mowing than fescues. 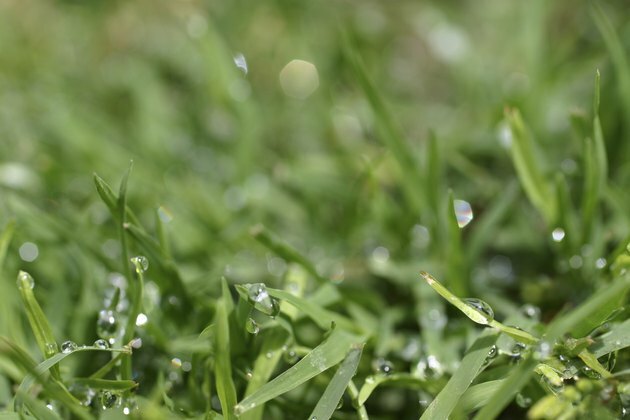 Tall fescue does not require mowing less than 3 inches high, and uses about half as much water as Kentucky bluegrass. Less watering means less mowing. Hard fescue and red fescue require little or no mowing. Rich, thick Kentucky bluegrass tolerates foot traffic and heavy use better than either hard or red fescue. However, coarse-bladed tall fescue is more tolerant of foot traffic than Kentucky bluegrass and can withstand the wear of people getting in and out of vehicles. Grayish to dark green, fine-bladed hard fescue fares best in parks, media strips and slopes that are not mowed. It is easily damaged by heavy traffic and does not recover well from overuse. Red fescue, another fine fescue, does not like heavy use. While Kentucky bluegrass prefers full sun, it will tolerate shade. It can live through cold winters, but is susceptible to weed invasion and diseases in climates with hot summers; it may go dormant and turn brown. Tall fescue will tolerate both drought and summer heat and resists disease and weeds. Hard fescue also tolerates drought and summer heat and is the grass of choice for shade. Red fescue tolerates drought and shade better than Kentucky bluegrass. It establishes quickly and is often planted around cabins, resorts and camps in cool mountain sites. Hard fescue tolerates drought, cold temperatures and shade.